Facebook is now allowing its virtual currency to be used off of its social network, a feature that some game companies are finding valuable as they seek new ways to monetize their own sites. One of the first partners is GameHouse, a division of Seattle-based RealNetworks. GameHouse will be using credits for both Collapse! 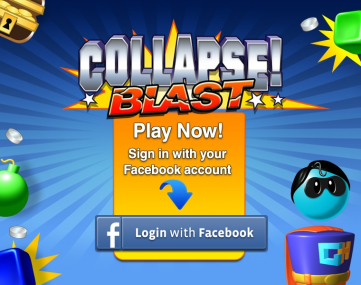 Blast and UNO Boost on its own game network at GameHouse.com. By integrating credits, GameHouse says players will now be able to switch back and forth between Facebook and GameHouse.com, while maintaining their scores and data. “We truly believe that every game will be social someday, whether it’s played on Facebook, Google+, or at GameHouse.com,” wrote GameHouse in a blog post. Since users will still log in to their Facebook accounts to play the games, technically the credits will be purchased directly from Facebook. GameHouse will still have to share 30 percent of the revenue from the sale of Facebook Credits, which is the standard cut on the social network. GameHouse is one of the first to try using Credits off of the network, but there will likely be others following. Earlier this month, Zynga announced Project Z, its own gaming platform, which will provide a seamless game experience between Facebook and its own Web site. Despite creating a separate game network, as we wrote at the time of the announcement, Facebook’s influence will be everywhere. Zynga will use Facebook Connect to enable game players to log in and play the games seamlessly between Facebook and Project Z, and although it declined to comment on the use of Facebook Credits, we can imagine with this trial there will be a role for them on the new platform, as well.